A blog reader sent a request to us for help in identifying the pattern of a master butter knife. It appears to be a very old Gorham piece. It is along the lines of Versailles and Mythologique. It’s 7 ½” long, weighs 49 grams – woman with wheat and a bull’s head on the front and a gargoyle face on the back. Can anyone out there help? Attach a comment or send us an email if you can. I tried searching for this pattern name, but not sure myself. Kind of looks like Versailles pattern, but I'm not sure if this pattern was a multi-pattern design. I have this knife, and was able to identify it through an article in Silver Magazine, March/April 2001, in which there is a 12 page article on the Versailles pattern (pages 23-34) which illustrates 21 different motifs for this pattern. 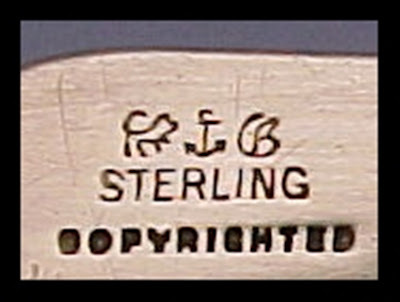 The butter knife motif is illustrated as #9. It's a very informative article, and I'm sure you'll agree, this is a lovely old sterling butter knife. Ann from St. Louis.